The University Women’s Club of Toronto is dedicated to supporting the education of women and girls, and helping women who are disadvantaged due to poverty, lack of education or other challenges. Our Foundation involves the awarding of scholarships and grants to students leaving high school, and to those continuing at college or university. Community service has been at the heart of our club since its beginning in 1903. Funding for the Club’s philanthropy work comes from UWC-managed investments, donations and club-organized fundraising events. The UWC (Toronto) Foundation trust is managed by a board, made up of members of the University Women’s Club of Toronto. Following on the work of The Heritage Fund, The UWC (Toronto) Foundation gives scholarships and financial awards to good students with financial need, attending schools in the central Toronto area. The Foundation’s board and members of the Charitable Activities Committee determine who the recipients are. The Club’s fundraising events are generally organized with a specific cause or beneficiary in mind. 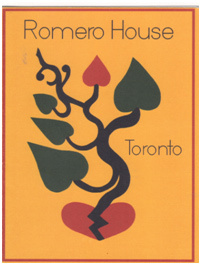 Recent fundraisers have raised money for Romero House, a centre for refugees in Toronto. Marianne, Jo-Lynne & Susan present a cheque to Sistering staff. Since 2018, we’ve been helping Sistering, a 24 / 7 shelter that provides meals, plus medical, psychological, social work and housing services to marginalized women and girls. They also encourage more education and provide skills to assist them in finding work. 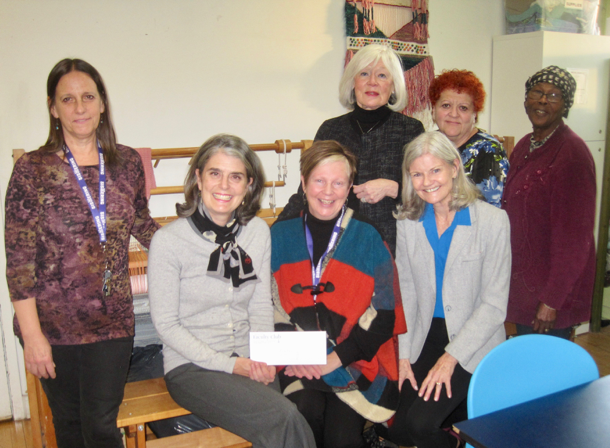 In 2018 we donated $10,000 for their sewing studio and $5000 for improvements to their sleeping area. In August 2018, the Faculty Club kindly donated the blue velvet curtain fabric they no longer needed. They were most appreciative. For the past few years, UWC has contributed to the education of refugee women and girls through our fundraisers for Romero House. In 2017 we raised $13,000 through our fundraiser Chopin & Champagne, and in 2018 $15,000 at our gala event Hola! A Night in Seville. The funds come entirely from the fundraiser and are administered by Mary Jo Leddy at Romero House. Throughout the year, we’ve collected items the families needed including clothing and household supplies. In May 2018, Carol Finlay, founder of Book Clubs for Inmates, make an appeal to UWC for books for the Grand Valley Institution for Women, a prison in Kitchener Ontario. Our members willingly responded and made generous donations, enough to overload the trunk of her SUV. You are helping to change the lives of many women who find creative outlet and therapeutic healing in our textile studio. Your generous gift in December 2017 of $10,000 will help us launch the sewing component of our education and training program at Spun Studio. AND, our sisters will enjoy additional warmth and comfort in the Drop In overnight with your wonderful gift of $5,000. Thank you for your belief and commitment to supporting some of Toronto’s most vulnerable women – I am grateful for your interest and generosity. At Sistering, we are driven by one simple truth: all women, regardless of circumstance, deserve to be treated with dignity and respect. It takes the kindness and generosity of many partners to make a difference in the lives of the women in our community. I look forward to our new partnership and we welcome your donations of fabric and wool – they will be inspirational for our creative souls in Spun Studio. Thanks a lot for your contribution in my life, and when I say my life someone would think I’m exaggerating but I am truly not. Having this laptop not only helps me but it really makes things easier for me. So a little introduction about me. My name is Sabreena. I’m 19 years old from a beautiful country named Etritrea. I love music, reading and watching movies. Soon enough I’m planning to go back to school for my undergrad and I can’t stress enough how big a part you guys and Romero House have played in helping me do so. This thank you note has gone on long enough so thank you, thank you, thank you and thank you. You guys are Awesome!!! With this letter I want to say thank you so much. Through Romero House I received the money that you kindly donated to support the education and empowerment of Romero House women. With this money I bought a beautiful laptop. My family also thanks you for your support. It is a generous gesture that demonstrates the fraternity that the Toronto University Women’s Club feels for other women. I really appreciate your donation and I am sure that the laptop will help all our family in our education. Thank you so much. Our children are the future, and carry with them a great potential to lead this country. 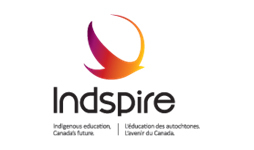 As Canada’s fastest growing demographic group, Indspire youth hold particular promise but they need your support! Thanks to the generosity of donors like UWC, we are building brighter futures for more indigenous youth every year. Thank you! Across Canada, everyone has a remarkable opportunity to do something truly incredible – to help close the gap in Indigenous achievement through education. We are thrilled by your investment in the ‘Building Brighter Futures’ program to support indigenous youth pursuing their post-secondary education. 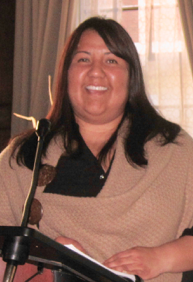 The University Women’s Club of Toronto’s investment in Indigenous youth across Canada will encourage and empower them, converting their ambitions and aspirations into solid achievement and brighter futures. Your commitment is sending a clear message that every child should be given that chance to succeed and for that we thank you. Paul Klein, CFRE, Director, Individual Giving, Indspire.